The Honda RA302 was a Formula 1 built in 1968 by Honda and introduced at the France GP. This car featured some exotic solutions as an air cooled V8 engine and a magnesium shell. The magnesium shell allowed the RA302 to be 80 kilograms lighter thanthe previous car, the Lola built RA301 V12. This car only appeared in one race, the 1968 French Grand-Prix at Rouen-les-Essarts. Jo Schlesser was choosen to drive the RA302 as John Surtees refused claiming the car was unstable and dangerous because of the magnesium shell. The race will unfortunately showed Surtees was right: On lap two, the RA302 crashed on a corner and instantly caught fire. The fact is magnesium burns at 2400° celisus (4352° Fahrenheit). It was then impossible to stop the fire and Jo Schlesser perished. A second chassis was built for Italy Grand Prix but Surtees, who would have been ok to drive the car if only it had been rebuilt with an aluminium shell, refused again to drive it. Honda then withdrew from Formula 1 and came back only in the 80's as a motorist and as a full manufacturer (chassis/engine) in 2006. The car was seen during test session then never seen again. 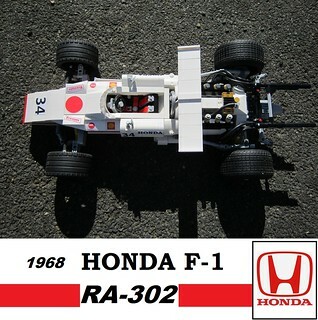 This car, the only RA302 remaining, is nowadays displayed at the Honda Collection Hall, Motegi, Japan. This car shows some differences with the original RA302 design (Central wing, Twin exhaust outlet per cylinder bank etc), this is this version i've built but the original one can be moded easily from this one. No joke, the RA302 was a VERY dangerous car. As a kid, i was very shocked hearing about Jo Schlesser (Jean-Louis Schlesser's Uncle, see my Sauber C9) accident and i learnt this day that magnesium is good...but sparingly.